This pack has seen some fairly aggressive use - and it's not even mine. This is still my brother's winter bag and has seen use from both of us on numerous occasions. The biggest test of comfort and usability was my use of it for about 150 miles of winter camping in Washington's Northern Cascades during the end of my 2013 Pacific Crest Trail thru-hike. Here are my thoughts having used this bag for winter camping in Vermont, and winter camping in Washington. This is a solid pack that is available now for the very reasonable price of $120 from GoLite. At 1 lb. 15 oz. this is a lightweight and highly versatile bag. Excellent compression for any load. 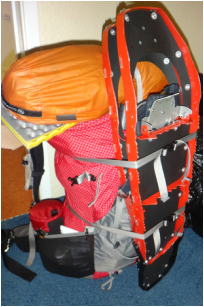 As seen it carried my MSR Axis Ascent snowshoes strapped to the back for many miles while climbing up to the peaks. Multiple strapping options offered enough options for 4 seasons of use. Roomy side pockets that fit 2 Nalgene bottles on each side, and could fit a narrow tent if needed. Large capacity fit all my winter gear with room to spare. Comfortable waist belt and shoulder straps carried the loads better than I expected. At one point I had 6 days of food and 2 liters of water, and had a total pack weight of about 40 lbs. A major drawback is that this is a totally frameless bag, with only a sewn in backpad to provide structure. This limits the comfortable carrying capacity to around 30 lbs., which for its large size and low price is still very good. Though I carried more weight in it than 30 lbs at times, all the weight went right to my shoulders and I often had to use my hands to support the shoulder straps and to help minimize the load on my shoulders. THE PACK I TRIED HAS BEEN DISCONTINUED and I have not actually tried the current offering of this bag - which is now called the JAM 70L and can be seen HERE at the GoLite website. There may be some stuctural changes that would change my opinion of the comfort. The sewing and build quality doesn't seem to be up to the same standard as some of the other manufacturers, but the bag has seen hard usage and shows no issues at all. SUMMARY: Worth trying out if you need a lightweight but large volume bag for a low price. My brother has no intentions of selling his, and after using it for such rigorous hiking as I did on the PCT, I give this bag overall high marks for value and broad usability.